By Liz Shaw, Eransmo Tacconelli, Robert Watson & Claudia Herbert. Self-Help books have become a modern publishing phenomenon, bookshops have whole sections dedicated to them, and a large of them are of questionable value, often being written by people who have little or no experience of the subject. Fortunately this book doesn�t fall into that category. 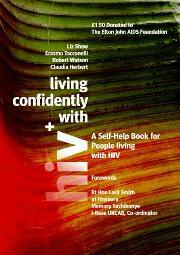 The authors are four Clinical Psychologists, all with extensive experience working with people who are HIV positive. The book has been designed as a guide for people newly diagnosed with HIV through what to expect and what to do following this change in their life. It is divided into three sections. The first part looks at the lifestyle implications of being HIV positive; healthcare, disclosure of HIV statues, stress, relationships and children. The second part looks at emotional strategies for coping with HIV, and the last section looks at a problem solving approach to living with HIV. Because of the authors� backgrounds and approach, this book may come across as �warm and fuzzy�, it certainly has a lot of emphasis on the emotional/psychological side of the experience, but for a lot of people this is what they can be swamped with when they are first diagnosed. It is refreshing though, to have a self-help book do this. This is not a book that is based on one person�s narrow experience of HIV. Unfortunately, there is little to offer nurses and other healthcare professionals here. Much of the advice will be common knowledge to many nurses, and the tone can come across as a bit simplistic; but this isn�t a book aimed at healthcare professionals, it�s aimed at the general population. The value of this book is that it can be recommended to patients or others. It could be very useful to someone newly diagnosed with HIV or someone struggling to come to terms with it.